The fascinating journey from born atheist to Greenbelt favourite. Sara Miles tells her unique story in 'Take This Bread' as a spiritual memoir with a call to action. "This book is a stunner. Beautifully and simply written ..." - James Alison. "The finest confession of faith I've read for years." - Phyllis Tickle, author of 'The Great Emergence. Raised as an atheist, Sara Miles lived an enthusiastically secular life as a restaurant cook and writer. Then one morning, for no earthly reason, she wandered into a church. She ate a piece of bread, took a sip of wine, and found herself radically transformed, embracing a faith she'd scorned and which would lead to feeding others in a way that she'd never imagined. Sara started a food pantry giving away literally tons of food from around the same altar where she'd first received the body of Christ, and providing hundreds of hungry families with free groceries each week. She embodied Christ's living communion, in conversion and action. Sara Miles is the Director of Ministry at St Gregory of Nyssa Episcopal Church in San Francisco and is Founder and Director of The Food Pantry. Greatly in demand as a speaker, preacher and workshop leader, she is always a favourite at Greenbelt. 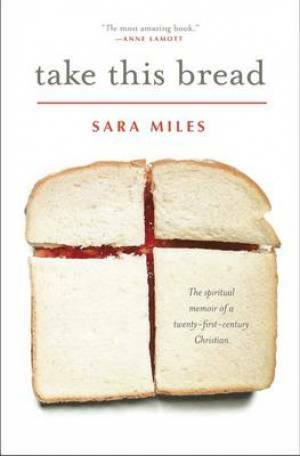 Take This Bread by Sara Miles was published by Canterbury Press in June 2012 and is our 9038th best seller. The ISBN for Take This Bread is 9781848252141. The story of an unexpected and terribly inconvenient Christian conversion, told by a very unlikely convert, Take This Bread is not only a spiritual memoir but a call to action. Raised as an atheist, Sara Miles lived an enthusiastically secular life as a restaurant cook and writer. Then one morning, for no earthly reason, she wandered into a church. She ate a piece of bread, took a sip of wine, and found herself radically transformed, embracing a faith she'd scorned and which would lead to feeding others in a way that she'd never imagined. Sara started a food pantry giving away literally tons of food from around the same altar where she'd first received the body of Christ, and providing hundreds of hungry families with free groceries each week. Take This Bread is rich with real-life Dickensian characters-church ladies, millionaires, schizophrenics, bishops, and gangsters - all blown into Miles' life by the relentless force of her new-found calling. Here, in this beautiful, passionate book, is Christ's living communion. Got a question? No problem! Just click here to ask us about Take This Bread.